Alzheimer's disease is a progressive brain disorder that gradually destroys a person's memory and ability to learn, reason and communicate. People affected can also experience distressing changes in their personality and behaviour. The number of people with Alzheimer's disease is set to triple in the next 30-40 year as the average age of the global population soars. Creutzfeldt-Jakob disease (CJD) is a prion disease which is a rare and fatal form of dementia that occurs in individuals between 40 and 80. However, in 1996 a new form of CJD (vCJD) prevalent in younger people was identified. Amyloid plaques such as those found in Alzheimer's patients can also be found in BSE and CJD victims. More information and help on coping with Alzheimer's can be found on http://www.alzheimers.org.uk . Brain scans are used in the diagnosis of dementia. Computerised Tomography (CT) and Magnetic Resonance Imaging (MRI) are two types of scan that generate images of the internal structure and condition of the brain. Coloured areas of the brain show differences in brain activity, appearance and metabolism. This representation of a scan was developed using inkblot techniques. with three different coloured inks. This was developed into a background for stitch where the pieces of coloured silks about to be bonded onto a white silk fabric. The design on the left represents Amyloid plaques, clumps of protein that accumulate outside nerve cells in Alzheimer's sufferers. Cords, couched and edged with embroidery will be applied to a silk background. This shows some of the stitches experimented with for the final panel. In the second design the plaques have been repeated and the colours altered to reflect those of the Alzheimer's society. The bottom yellow layer is made up of organza and fine cotton with a layer of blue cotton on top with the image cut out. 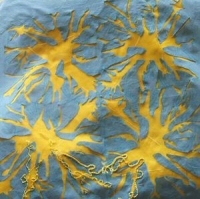 Yellow threads will be couched on top to represent the knotted clumps of protein. The embroidery around the plaques reflects the symptoms of the disease notably confusion, loss of memory and agitation. In addition to Amyloid plaques, structures known as Tangles are also found in Alzheimer's suffers. These are twisted strands of a different protein that form inside the brain cells. It is unknown at this stage whether these structures cause Alzheimer's or are a by-product of a different process currently undiscovered. This design has been worked on a background of scollata with a rubbing taken using fabric crayons and a layer of net on top. The individual tangles are embroidered on a silk background and padded before being applied to the background. Made by Charlton, Wantage and The Letcombes WI's. Bovine Spongiform Encephalopathy (BSE) is a is a type of prion disease that affects the brains and central nervous system of adult cattle. It is caused due to a build-up of abnormal prion proteins. This accumulation causes the brain to shrink and deteriorate giving it a spongy appearance. Symptoms include disorientation, clumsiness and aggressive behaviour. This spongy effect has been portrayed using free machine embroidery onto a dissolvable fabric to form a lace effect with areas of fabric hand appliqu�d. Made by Watlington WI, Otmoor WI, Chalgrove WI, Waterstock and Tiddington WI, Benson WI and Cuddesdon and Denton WI.